Questionnaires are used as a part of market research to gather data that is crucial to the success of a specific business venture. A marketing survey questionnaire is used to collect information that cannot be obtained from secondary sources like the internet, books or newspapers. Questionnaires are frequently used in different types of market research like quantitative, qualitative and social research. Businesses use market research questions to find out a consumer's opinion on their proposed or existing products / services. Different types of survey questionnaire are used to interrogate the customer. The results are then evaluated. A market research questionnaire can tell you more about the demand for a new product/service, the buying behavior of customers, and the attitude of customers towards the proposed product/services. With careful questionnaire construction, you can also find out about the awareness for your product, service or business among your customers. The effectiveness of the questions can be evaluated by the structure of a questionnaire. If the questions are not carefully structured, then you may obtain results that are inaccurate, irrelevant or inconclusive. If you are planning to develop a market research questionnaire, then read further to find out how to structure and develop a questionnaire with the different types of market research questions. With the right marketing survey questionnaire, you can gain an accurate response that can be used for constructive analysis and feedback. This refers to a type of question that is answered only if an individual gives a specific response to a previous question. Using this type of question allows you to skip asking further questions to respondents, who gave a different reply initially. Identical response categories are used in matrix questions. The questions are usually placed one below another, thereby forming a matrix with response categories on the top and a list of questions on the side. Matrix questions make an effective use of the time of respondents and the page space. Yes/No Questions: The respondent can answer only with a "no" or "yes"
Sentence Completion: Individuals are asked to complete an incomplete sentence in their own words. For example, a respondent will be asked to complete a sentence like "My most important consideration in buying a new product/service is..."
Questionnaire construction refers to a series of questions which should be asked to individuals in order to gather statistically useful information about a specific topic. 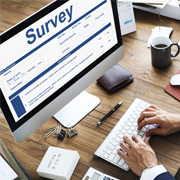 Paying attention to questionnaire construction can play a critical role in ensuring the success of a survey. Steer clear of bad questionnaire formats, inappropriate questions, incorrect scaling and incorrect ordering of questions, as this may not reflect the accurate views of your respondents. Need help with developing a successful marketing questionnaire? Outsourcing marketing questionnaire design to an expert service provider like Outsource2india can save the day. We can help you get started instantly with your questionnaire, choose the right words and decide on which questions will be right for your target audience. Our team can also assist you with questionnaire construction and list out your questions in the right order cost-effectively. Contact us right away to get started on a marketing survey questionnaire.